Xamarin.Forms now has preview support for GTK# apps. GTK# is a graphical user interface toolkit that links the GTK+ toolkit and a variety of GNOME libraries, allowing the development of fully native GNOME graphics apps using Mono and .NET. 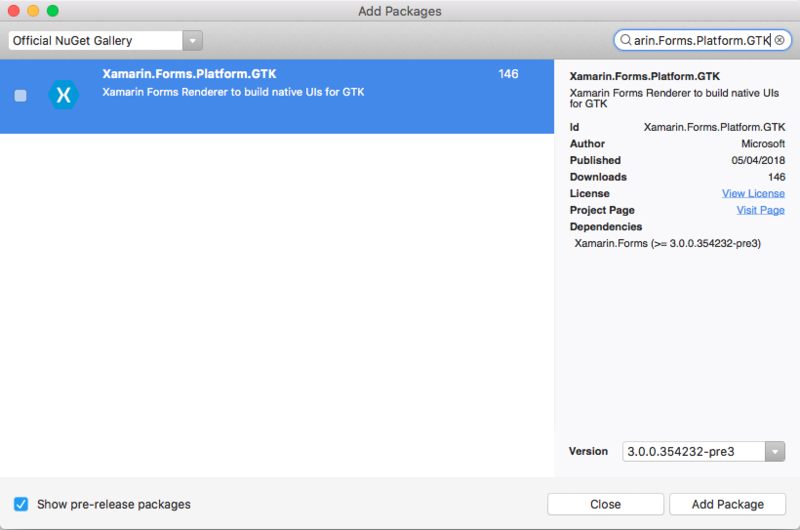 This article demonstrates how to add a GTK# project to a Xamarin.Forms solution. Before you start, create a new Xamarin.Forms solution, or use an existing Xamarin.Forms solution, for example, GameOfLife. 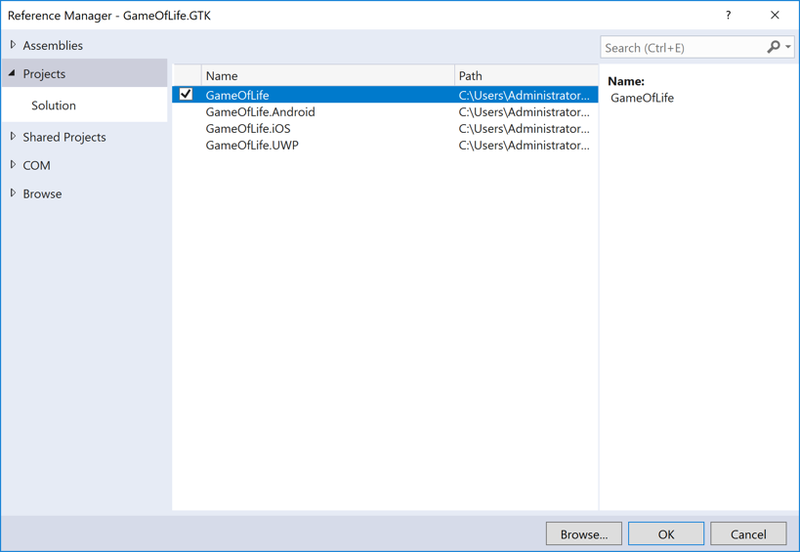 While this article focuses on adding a GTK# app to a Xamarin.Forms solution in VS2017 and Visual Studio for Mac, it can also be performed in MonoDevelop for Linux. GTK# for macOS and Linux is installed as part of Mono. 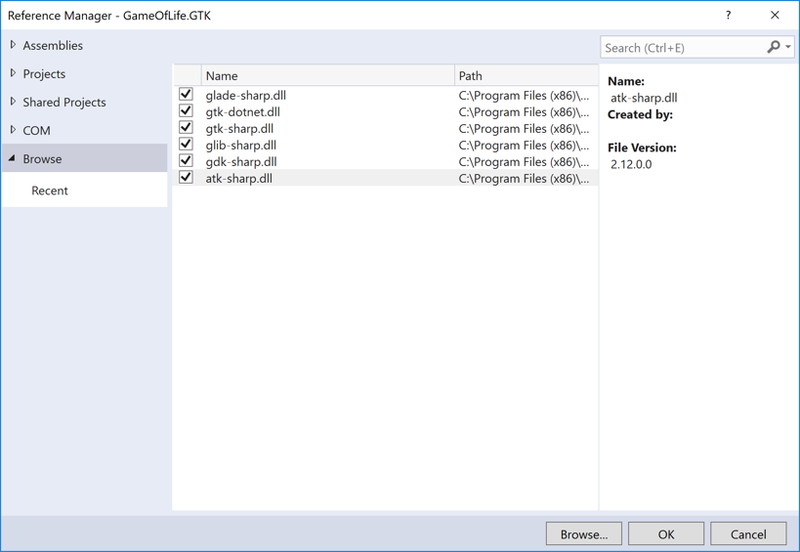 GTK# for .NET can be installed on Windows with the GTK# Installer. In the New Project window, at the left select Visual C# and Windows Classic Desktop. 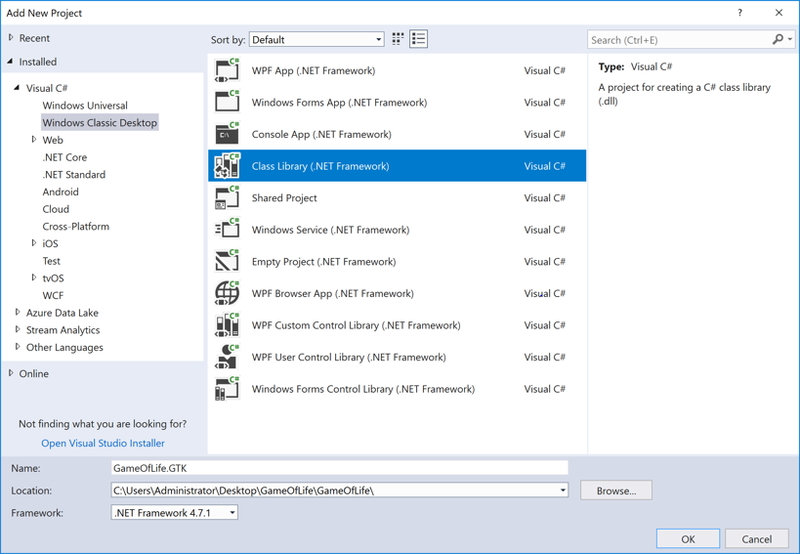 In the list of project types, choose Class Library (.NET Framework), and ensure that the Framework drop-down is set to a minimum of .NET Framework 4.7. 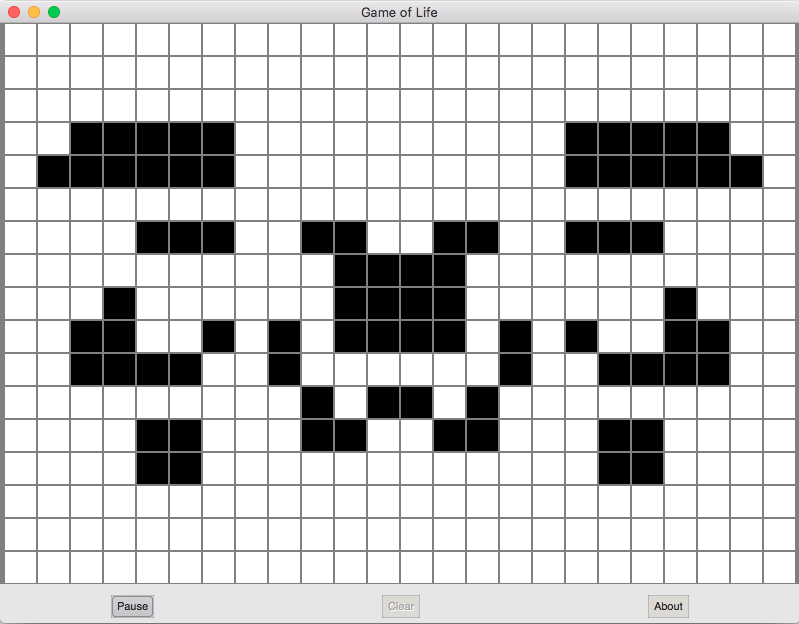 Type a name for the project with a GTK extension, for example GameOfLife.GTK. Click the Browse button, select the folder containing the other platform projects, and press Select Folder. This will put the GTK project in the same directory as the other projects in the solution. Press the OK button to create the project. In the Solution Explorer, right click the new GTK project and select Manage NuGet Packages. 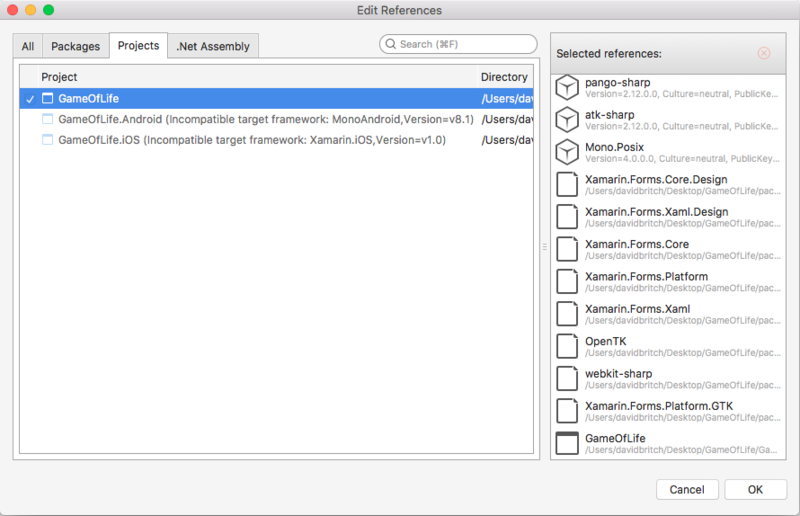 Select the Browse tab, and search for Xamarin.Forms 3.0 or greater. Select the package and click the Install button. 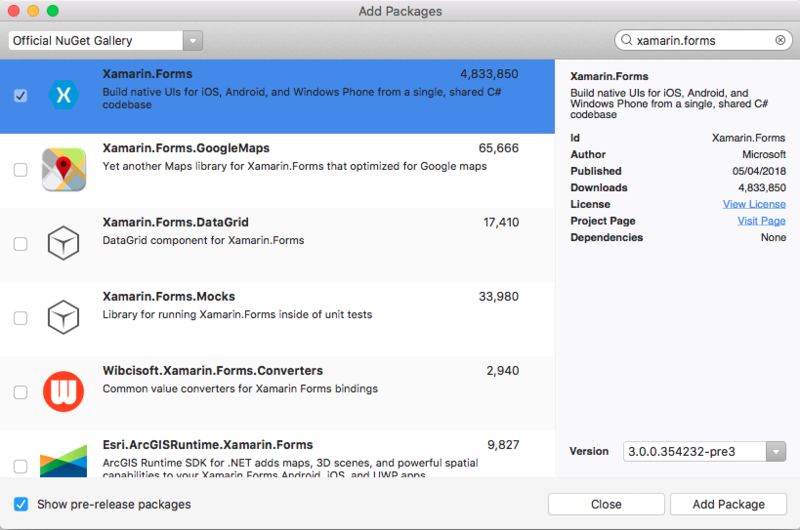 Now search for the Xamarin.Forms.Platform.GTK 3.0 package or greater. In the Solution Explorer, right-click the solution name and select Manage NuGet Packages for Solution. Select the Update tab and the Xamarin.Forms package. Select all the projects and update them to the same Xamarin.Forms version as used by the GTK project. In the Reference Manager dialog, press the Browse button and browse to the C:\Program Files (x86)\GtkSharp\2.12\lib folder and select the atk-sharp.dll, gdk-sharp.dll, glade-sharp.dll, glib-sharp.dll, gtk-dotnet.dll, gtk-sharp.dll files. Press the OK button to add the references. In the GTK project, rename Class1.cs to Program.cs. This code initializes GTK# and Xamarin.Forms, creates an application window, and runs the app. In the Solution Explorer, right click the GTK project and select Properties. In the Properties window, select the Application tab and change the Output type drop-down to Windows Application. In the New Project window choose Other > .NET > Gtk# 2.0 Project and press Next. 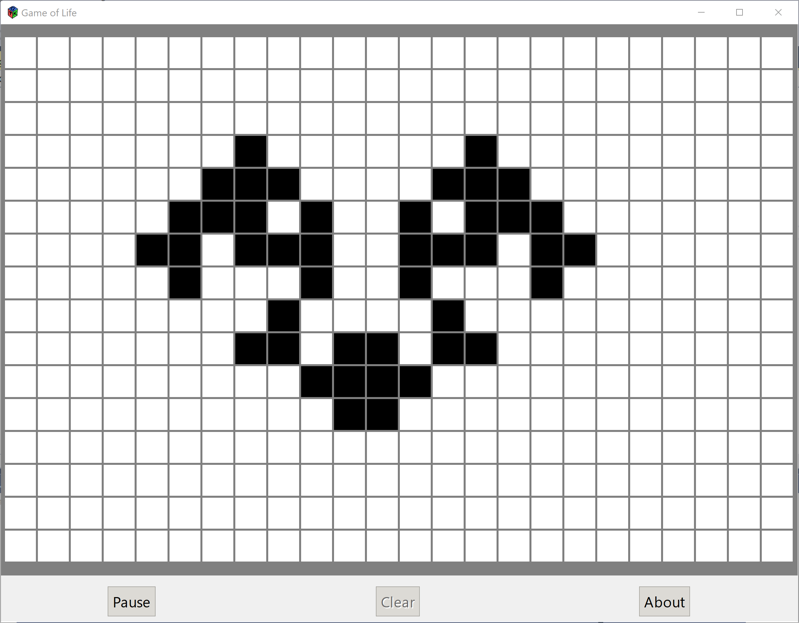 Type a name for the project with a GTK extension, for example GameOfLife.GTK, and press Create. In the Solution Pad, right-click on Packages > Add Packages... for the GTK project, and add the Xamarin.Forms 3.0 pre-release NuGet package or greater. In the Solution Pad, right-click on Packages > Add Packages... for the GTK project, and add the Xamarin.Forms.Platform.GTK 3.0 pre-release NuGet package or greater. Update the other platform projects to use the same Xamarin.Forms version as used by the GTK project. In the Solution Pad, right-click on References > Edit References... for the GTK project, and add a reference to the Xamarin.Forms project (either .NET Standard or Shared Project). In the Solution Pad, right-click the GTK project and select Set as Startup Project. In the Visual Studio for Mac toolbar, press the Start button (the triangular button that resembles a Play button) to launch the app. You can determine what platform your Xamarin.Forms application is running on from either XAML or code. This allows you to change program characteristics when it's running on GTK#. In code, compare the value of Device.RuntimePlatform with the Device.GTK constant (which equals the string "GTK"). If there's a match, the application is running on GTK#. For more information about Native Forms, see Native Forms. This is a Preview, so you should expect that not everything is production ready. For the current implementation status, see Status, and for the current known issues, see Pending & Known Issues.